Associate Professor in UCT’s College of Accounting Jacqui Kew, who worked on the Walter Sisulu accreditation process, said the project is a good example of how collaboration can achieve transformation. The process, explained Kew, was multipronged. “That is why it was so successful. It looked at physical infrastructure such as facilities and computer labs, staffing and academic content, as well as internal processes such as admin, HR, and setting and marking exams,” she said, adding that the universities engaged with and adapted the material to best suit the needs of their students. Associate Professor Goolam Modack, head of UCT’s College of Accounting, said the partnership was a two-way street that also benefited academics at all the institutions involved. 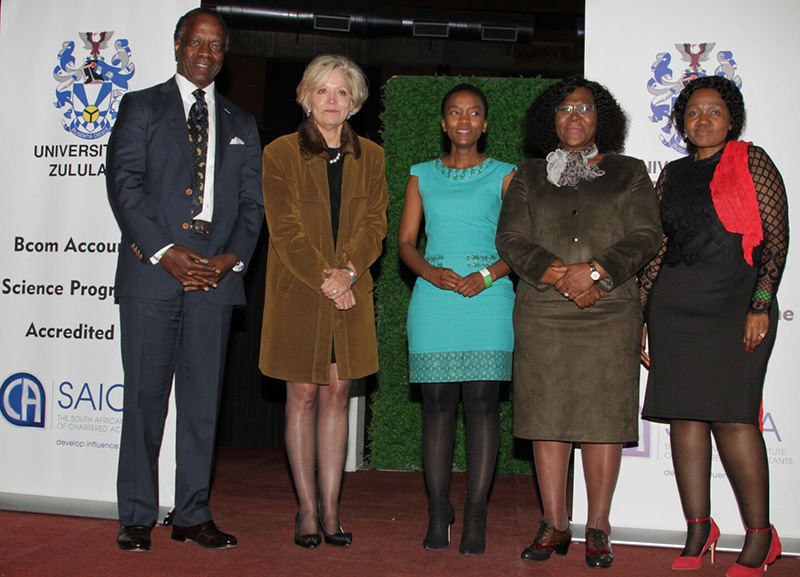 Project partners (from left) Sizwe Nxasana (Thuthuka Board member), Chantyl Mulder (SAICA executive director), Mia Nosipho Makhanya (BANKSETA chairperson), Prof Xoliswa Mtose (VC and Rector of the University of Zululand), and Sphelele Khosa (Head of Department: Accounting, University of Zululand) at the SAICA accreditation ceremony held at University of Zululand. 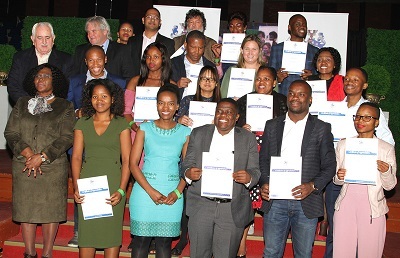 Financial and accounting skills are widely recognised to be key drivers of any healthy economy and SAICA, through its Thuthuka Education Upliftment Fund, partners with universities to build additional capacity to offer accredited qualifications leading to a career in chartered accountancy. Building sustainable capacity in rural communities to provide the same quality of education available in the rest of the country has been a key priority. Gugu Makhanya, SAICA senior executive: transformation and growth, praised both universities for the changes they made, saying the improved quality of the degrees will enable students to receive top-quality undergraduate degrees without having to travel to distant universities. “What is most pleasing about the accreditation is that we have seen students pursue postgraduate study in other provinces and then return home to do their articles. They are committed to uplifting the communities where they came from, in the spirit of ubuntu, which is what Thuthuka encourages,” she said. UniZulu graduate Celumusa Mkhabela is a case in point. He is completing his training at Deloitte in KwaZulu-Natal following postgraduate studies at UCT, and hopes to go on to start an accounting firm back home. “At university I received excellent technical training. Now I am preparing for the practicalities of work. It’s a steep learning curve. It’s not about what I know, but what I am willing to learn – and how I focus on my goal,” he said. Another UniZulu accounting graduate, Sanele Ntuli, said the impact of the SAICA accreditation is significant. “Students will no longer have to leave their homes to get an accredited accounting degree, which is particularly important considering this is a previously disadvantaged university,” he said. Ntuli, who was born and raised in Inanda township in KwaZulu-Natal, also completed his PGDA at UCT and is now also doing his training at Deloitte in his home province. After the two-year training period and writing the SAICA board exams, he plans to travel and work abroad, gaining exposure to global business. “I see myself as a global citizen, and I would like to gain experience internationally. But then I would like to come back to South Africa and put my skills to good use here,” he said. UCT’s Associate Professor Ilse Lubbe, who was involved with the UniZulu accreditation process, said accreditation uplifts not only the university, but the entire community. “Transformation has a broader narrative – it’s about what you do. In working closely with UniZulu management at all levels to achieve their aims, we helped to further transformation in the accounting profession, but more than that, to build the capacity of accounting in South Africa,” she said. The accreditation milestone doesn’t signal the end of the partnership, however, and Modack said the universities would continue supporting one another at an individual and course level.